The PO, Library and campground are located on the Piha Domain, which was created when Piha was subdivided in the 1930s, but even before then it was a campground and picnic area. 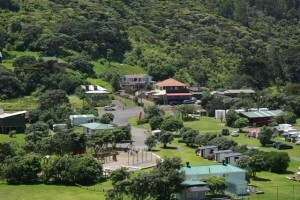 Also are on the Domain are the Bowling Club, Tennis Club, playground and facilities for campers, such asÂ the cookhouse. The village is also where visitors to Piha often stop off first, to use the toilet after the long car-ride, and grab a drink or icecream.